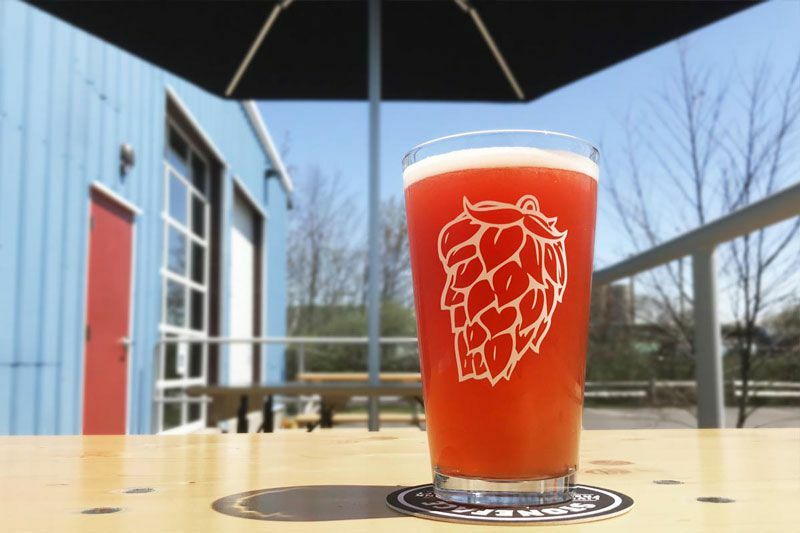 In just five years, the number of New Hampshire breweries has more than doubled to a whopping 72, and that means whatever part of the Granite State you visit, you won't be far from fresh, inventive local brews. Some of these breweries are household names: One even reliably advertises during the Super Bowl. Others are forging rabid followings with their highly rated artisan beers. If you're a beer fan planning a New Hampshire getaway, Brew NH's map of breweries statewide will help you locate worthy stops along your route. Want to make sure you don't miss the musts? Here's your guide to nine of the best breweries to visit in New Hampshire, where tasting beer is just part of the experience. Home of five of the top 10 beers in New Hampshire as rated by Beer Advocate, this five-year-old brewery is a prime destination for beer connoisseurs. Luckily, its southern New Hampshire location in Newington, just outside of Portsmouth, makes it an easy trip from Boston and tough to skip if you're bound for points north in New Hampshire or Maine. Stoneface RIS, a Russian Imperial Stout, has even eclipsed Hopulization, the brewery's highly praised New England-style double IPA, as the one to try, but with 12 fresh-made beers on tap, you're going to agonize. A super-affordable menu of nibbles and bigger bites makes it easy to linger and savor several of Stoneface's brews, and in a playful twist on the typical, adults are allowed to order from the kids' menu. Hold up, beer snobs. Before you dismiss the idea of visiting beer giant Anheuser-Busch's brewing facility in Merrimack, New Hampshire, there are a few things you need to know. First, factory tours here — either the Bud Light Experience ($10 for adults, $5 for visitors under 21) or the Beermaster Tour ($35 for adults, $10 for visitors ages 13 to 20) — are fascinating, and the scale of this operation will mesmerize and amaze you. Plus, you'll have the unique chance to sample beer right from the finishing tank. Second and critical: You'll likely get to meet the famous Budweiser Clydesdales. When they're not touring, Budweiser's East Coast Hitch is stabled here. Now, let's talk beer. While Anheuser-Busch is best known for its Budweiser and Bud Light products, the diversity of beers being brewed in Merrimack will surprise you, and the Biergarten is your place to sample a range of the company's products. While you're visiting, you'll also want to shop tax-free at Merrimack Premium Outlets, located across the street. Ah, the smell of fresh beer in the morning! They've been making beer at this North Woodstock, New Hampshire, country inn for more than 20 years, so if you're searching for a home base for your New Hampshire beer tour, what better place to stay? For a true immersive experience, consider booking a Brewer's Weekend package for a hands-on chance to help invent a new beer, plus behind-the-scenes learning and special dining opportunities. Even if you're staying elsewhere in the White Mountains, visit the brewery, where tours and tastings are offered at noon Sunday through Friday and at 4 p.m. on Saturday. Or end your Kancamagus Highway scenic drive with a memorable meal at one of the inn's four pubs. In Littleton in the northwest corner of New Hampshire, this brewer of an array of European-style beers also crafts bold American ales under its Resilience label, and that means a trek here is bound to delight practically every beer palate. You can't get much more New Hampshire than a brewery housed in a three-story, 1700s grist mill with an outdoor deck overlooking the Ammonoosuc River, and the photogenic backdrop adds to the tasting room experience. Stay a while and nibble on a wood-fired pizza or a selection of local meats and cheeses. Founded in Portsmouth in 1994 and named after Smuttynose Island, one of the storied Isles of Shoals just off New Hampshire's petite coast, the state's largest craft brewery relocated in 2014 to Towle Farm in Hampton. Here, just an eight-minute drive from Hampton Beach, you'll love embarking on a free brewery tour, tasting distinctively New Hampshire beers like Shoals Pale Ale and the acclaimed Robust Porter, sampling SmuttLabs' most recent experimental brews and dining at Hayseed Restaurant, which serves beer-inspired fare in a Victorian farmhouse. Smuttynose Brewing Company also hosts frequent events including Paint Nights, Game Nights and dog-friendly Snouts Out Sundays. In Conway, New Hampshire, gateway to the White Mountains, Tuckerman is the place for skiers and outdoor adventurers to drink beer. The tasting room with its 43-foot-long curved bar is where you'll want to start. Tastings are offered daily — what's on tap changes often — and a warm pretzel with Tuckerman's own beer mustard is a must. Twice daily, you can hop on a tour of the brewing operation. In the summer, Tuckerman hosts an outdoor concert series featuring top regional bands, and you'll want to bring a blanket or chairs and kick back with a Rockpile IPA or orangey-flavored Summer Ale. Who makes the #1-rated beer in New Hampshire according to Beer Advocate? It's little nanobrewery Kelsen in Derry, NH, where Robert Frost once lived. It's a treat to visit the Robert Frost Farm, and surely New England's most beloved poet wouldn't mind you stopping here for beer on a snowy evening. Top-rated, dark, foamy and bold Vinátta Russian Imperial Stout is brewed just once each year — in the winter — but if you miss this rare release, you'll still find ample reasons to visit the tap room including the almost-as-coveted Vendel Imperial Stout. Label art, which features Viking and Medieval warriors, makes this a fierce beer to take home in bottles to share with friends. Why make a pilgrimage to this community-loved brewery in New Hampshire's Great North Woods? To taste bold craft beers made with water from a secret stream. To quench your thirst after an epic day of mountain biking on Bethlehem's trail network. To feast like a locavore on poutine, burgers, sandwiches, and other eclectic menu items made with ingredients sourced nearby. To see changing exhibits of work by featured local artists. To hear live music four or five nights a week. To play trivia on Thursdays. And to ask owners Ian Dowling and Marlaina Renton to share their story. Enjoy a taste of Nantucket and its island vibe in New Hampshire. This large brewpub and its lively outdoor beer garden, located at Portmouth's Pease International Tradeport, is your place to sample Cisco Brewers' flagship beers and new releases and to chow down on beer-infused foods like Maine mussels steamed in ale and IPA-battered haddock. The facility, owned by the multibrand Craft Brew Alliance (CBA) and long the domain of Redhook Ale Brewery, switched gears in the summer of 2018 as part of CBA's efforts to expand Cisco's fan base beyond its island home. One sip of Whale's Tale Pale Ale, and you'll be in the club. Call ahead to check brewery tour times, and watch Faecbook for upcoming brewery-hosted events.